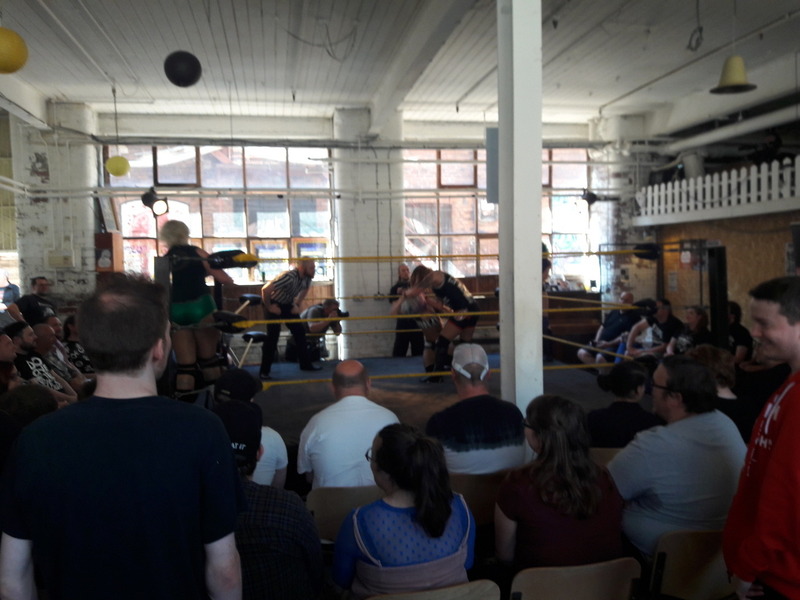 GRAPS AND CLAPS REVIEWS – TIDAL WRESTLING ‘HELL HATH NO FURY’. 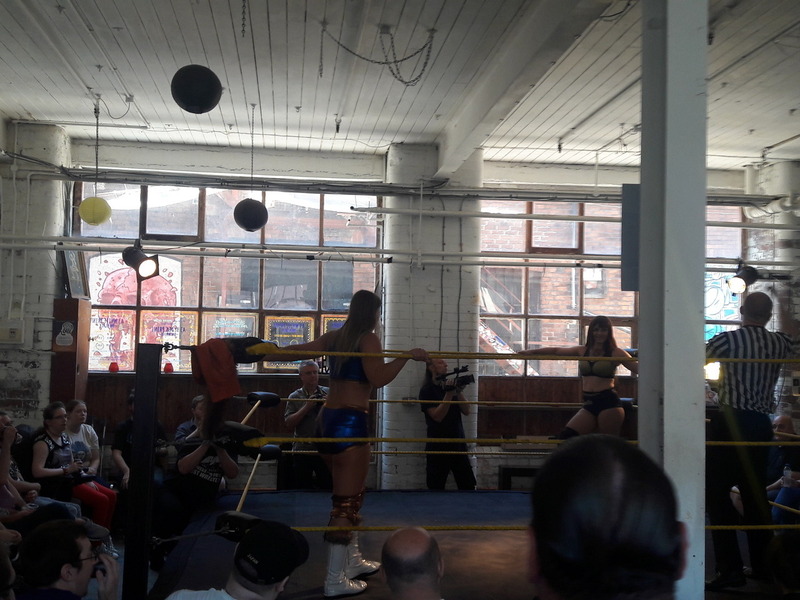 Hello and welcome everyone to this edition of Graps and Claps which took me on a journey to a baking hot Leeds for a double header of Tidal Wrestling action, first off with an all-womens show in the afternoon entitled ‘Hell hath no fury’, which was then followed up by the main card called ‘The Battle of LS2’ featuring the return of Sugar Dunkerton to where it all began for his fabled chant. This 1st part will focus on the afternoon show. Setting off at a relatively early time of 10:45am from Rochdale Train Station on the 1 hour journey to Leeds. Once arriving I embarked to the usual meeting spot of TAPPED whilst our Geoff cashed in his free pint across the road at The Griffin. Meeting up with Andrew Campbell and Ben, I took up a pint and half in this boozer with a 5% Brass Castle Raspberry & Ginger Saison proving very tasty with a strong taste of gingeR costing £4.20. The half pint was a £2.60 Lervig House Party Tropical IPA which was quite refreshing in taste. 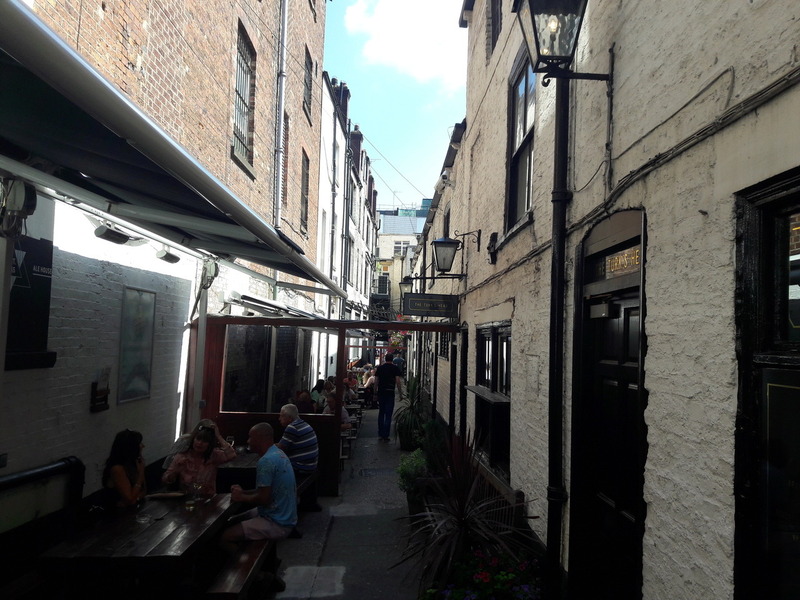 Once Athers had arrived we moved on to Whitelocks which is the oldest known pub in Leeds with a narrow but pleasant seating area outside. Here I had a pint of £4.70 North Riding Brewery NE IPA which hit all the notes and all a half of Northern Monk Eternall session ale to pass the time along till Shauna turned up. Leaving Whitelocks we was greeted with an interesting street act, in which the fella in question attempted and successfully jumped through fire, glass and sharp knives around separate windows. Arriving at the Temple of Boom we were greeted with the news that Adam Brooks was unable to compete due to him being a silly boy with rail tickets/oyster cards. 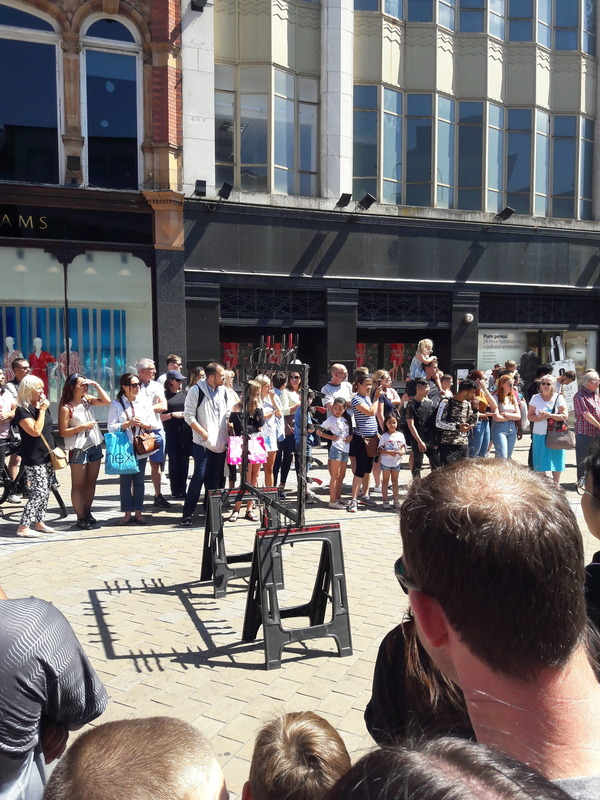 For the first show of the afternoon there was a healthy crowd in attendance for the Women’s section of the show, having spoken to the promoter later on in the evening he was quite chuffed at this and it looks like another will be taking place in the near future. This show consisted of 4 1st round matches in this mini tournament and a fatal 4-way with all the winners, the winner of this fatal 4-way would go on to face Little Miss Roxxy in the evening show to then go on to face the TCW Women’s Champion Mia Yim later on in the year. 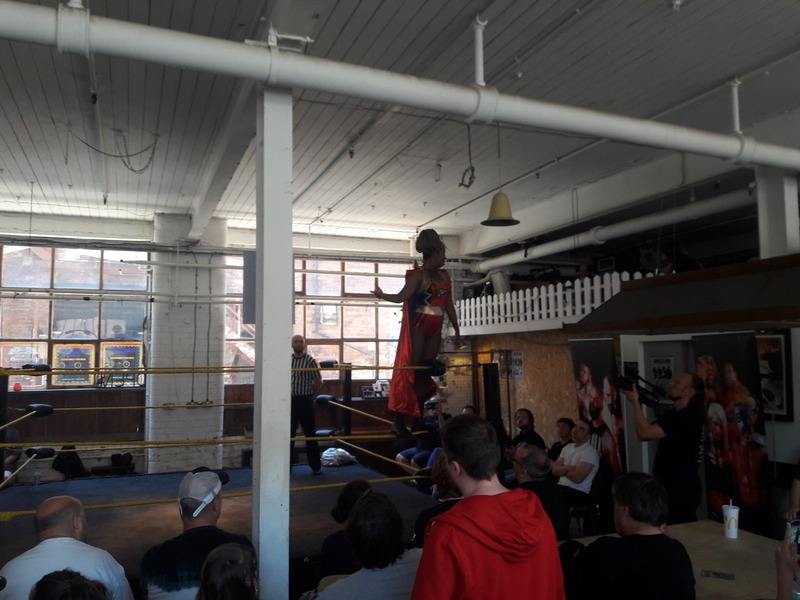 First match was between Leicester’s own Shauna Shay wearing a furry tail and coming out to a banger of a tune from Kasabian, her opponent would be Eliza Roux who I last saw impressing on a Southside show not too long ago. Roux had the early advantage catching Shay in the ropes with repeated clotheslines, but Shay came back with a front face ddt to Roux to get the 3 count to advance. Next up was Natalie Sykes who was making her Tidal debut against Rhio for whom the fans took an instant dislike to with them booing her straight away including a rendition of Purple Rain for Rhio’s purple locks. Also a rendition of Rio by Duran Duran from the dulcet tones of our Geoff which got a round of applause. This was a dominant performance by Rhio who finished off Sykes in quick fashion with a Roll of the Dice Neckbreaker for the 3 count, Rhio in this baddie role has potential. Third match of the afternoon was between Violet O’Hara and Sierra Loxton. A hard hitting match with strikes and running tackles that were just ooooossh, when Sierra was on the offence she looked very good and could be one to keep an eye out for on the scene, the running arse tackles in the corner had great impact. Sierra picked up the victory on O’Hara with a bridging German Suplex for the win – great stuff. Fourth qualifier was between best friends but better enemies Chakara and Candyfloss. Another good contest to follow the previous match with Candyfloss spending most of the match trying to work the arm of Chakara but ultimately failing as Chakara finished Candyfloss off in just over 10 minutes with the Widow’s Peak for the victory. Chakara has a great look with masses of potential for someone who is only in her infancy as a performer. A break was then had where people took in the culinary delights of the Temple of Boom which they are well known for, this times scran was Mom’s Thai Curry packed with Tofu and a multitude of veg to set your tastebuds alight costing £5. Usually with Thai Curry it cam be packed with heat but this was a more milder version that hit all of the right notes. Back from the break we returned with Tag Team action with Bars & Stripes (Rhia O’Reilly (OH REALLY) & Addy Starr vs Persephone and Little Miss Roxxy. After a lot of early stalling from O’Reilly and Starr who spent time jaw jacking with the fans. A lot of this match was based around Starr and Roxxy cutting off the ring to great effect beating down Persephone and thus not letting her tag in Roxxy in the other corner. With Persephone still being beat down she was then handcuffed by Bars and Stripes in the corner whilst the referee was pre-occupied with Roxxy protesting. Roxxy soon got fed up and ran in to lay waste to O’Reilly and Starr, but with Persephone still handcuffed Bars and Stripes did their best Eddie Guerrero to make it look like Roxxy had hit them with a chair, which led Cowboy John to turn around and DQ Roxxy to the boos of the crowd – BOOOOOOO!!! Main event time next with the Fatal 4-way under elimination style rules to determine who would face Roxxy later on in the evening for the chance to become No.1 contender against Mia Yim at a later date. This was a good match but there was confusion over the elimination rules as all the wrestlers broke up pins on a number of occasions which was a bit head scratching for some of the audience. Chakara who capitalised on two occasions by first eliminating Sierra Loxton and then Shauna Shay, then came face to face with Rhio as she looked to do a clean sweep of the competition. As both were baddies, the crowd ultimately had to pick a side and they sided with Rhio which was the right choice as she finished Chakara off with the Roll of the Dice for the victory and a match vs Little Miss Roxxy in the evening show. After the match though Rhio shouted that she didn’t need the crowds help, soon enough the jeers of the crowd sent her packing to the back. Overall a good two hour show with the Loxton vs O’Hara and Chakara vs Candyfloss matches as ones to look out for on VOD. Next time which will be very soon, will be a review of the Tidal evening show in Leeds.